Kathmandu, the capital of Nepal needs no introduction for a traveller. 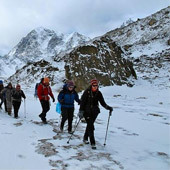 Famous as the gateway of Nepal, Kathmandu has a unique heritage quotient that makes it the most visited destination in the country. Definitely, the largest city of the country, Kathmandu Valley is also famous as a UNESCO world heritage site for its historical and cultural wonders. In a way, it can be said that Nepal’s history is synonymous to Kathmandu. Derived from the Sanskrit word, Kashtamandap or wooden pavilions, Kathmandu owns a variety of wooden heritage in the form of temples, pavilions, pagodas, shrines and intricate heritage buildings. The Hindu temples of Pashupati and Changu Narayan. Kathmandu Durbar Square represents the core of the city. Located in the middle of Kathmandu, the Durbar Square served as an ancient seat of the Nepalese royalty. It is also known amongst locals as Hanuman Dhoka, dedicated to Hindu God, Hanumana. The deity presence on the entrance of Darbar Square assures protection and security to the complex. More than just a royal seat, the Durbar Square was also the center for cultural activities, administration and festivals. Within the Durbar Square, the structure called Kumari Bahal is the home to Kathmandu’s own living goddess Kumari. 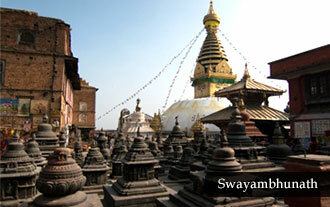 Patan, the sister city of Kathmandu is also known for its exciting share of heritage. 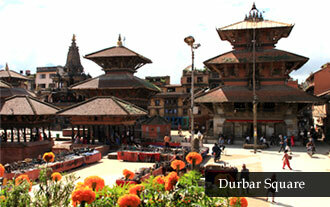 Located on the banks of River Bagmati, Patan or Lalitpur also has a world heritage Durbar Square. It is believed to be the oldest of the three recognized squares by UNESCO. The heritage courtyard was built by King Veera Dev in the 3rd century and perhaps has the finest collection of temples and palaces in the whole of Nepal. Bhaktapur or the city of devotees was founded by King Ananda Dev in 1197 A.D. It has the densest collection of temples, pagodas, shikhara style monuments, palaces, Buddhist monasteries and shrines, etc. The iconic stupa of Swayambhunath is a UNESCO World Heritage Site and also one of the country’s most sacred Buddhist shrines. The all seeing eyes on the four sides of the stupa symbolize the eternal presence of Buddha in all directions of the universe. Another stupa in Kathmandu valley, Bodhnath is again a Buddhist pilgrimage site in Nepal and also the Asia’s largest stupa. The hemispherical white stupa is also the center of activity for Tibetan monks and monasteries. 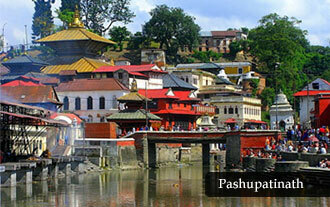 Nepal’s holiest Hindu shrine, Pashupatinath is one of the most important shrines in the valley. Located on the cremation ghats of the sacred Bagmati River, the shrine dedicated to Lord Shiva draws holy men from across the subcontinent. Built in the two-tiered pagoda style, Changu Narayan Temple (Bhaktapur) is dedicated to different avatars of Vishnu or Narayana, the fulfiller of mankind. 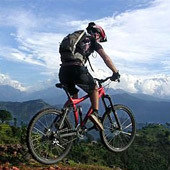 By By Air – Kathmandu is the only internationally connected destination of Nepal. 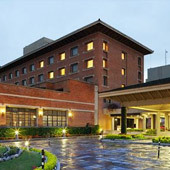 Tribhovan International Airport is the arriving point of many Asian and European flights directly. Kathmandu is the center of all festivals in Nepal. The festivities like Basanta Panchami, Losar – Tibetan New Year, Shiva Raatri, Phaagun Purnima (Holi), Chait Dasain, Seto Machhendranath Jaatra a chariot procession, Nawa Barsa - Nepali New Year, Machhendranath Rath Jaatra, Buddha Jayanti, Gaai Jaatra, Krishna Astami, Indra Jaatra, Dasain, Tihaar, etc are the number of festivals that can be enjoyed heartily in Kathmandu city.